Labor Day weekend, Heinz Field hosts an annual Kickoff and Rib Festival to start the Steelers season. In the 8 years I have lived in Pittsburgh, I have never attended Ribfest until this year. I’m a bad foodie and BBQ aficionado for having never attended. There are many reasons I’ve never attended. Generally I hate waiting in long lines and paying way too much for food. 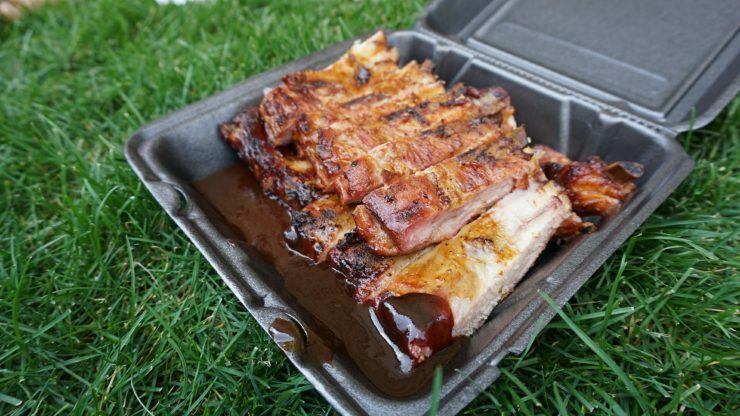 Ribfest is a great way to do both. There are great things about Ribfest. There are lots of vendors with games and raffles and trying to sell you crap. There are lots of festival food vendors. Musicians entertain every evening. Of course, there is also loads of BBQ. Every BBQ vendor there sells at pretty much the same options at the same price. Obviously the best part of the Ribfest is the ribs. $8 for 3 ribs, $15 for a 6 rib half rack and $25 for a 12 rib full slab. One of the bad things is a half rack or full slab are a little pricey, but worth it if sharing with people. However, there are many meal options available that come with sides or combos that are quite reasonably priced. I rarely do reasonable things when it comes to food. I ended up ordering a full slab from Pigfoot, which I just learned placed second in judging this year. I got in their line only because they had one of the shortest lines and they had 2 lines. I was so wrong to think they were fast. The main reason I got a full slab was because I didn’t feel like waiting in line again. I waited about 30 minutes in line for food at a booth that had 2 lines. I don’t think it was because Pigfoot was slow making food. I just think people don’t know how to order food. When waiting in line that long for food, especially at an event where every vendor is selling the same items or ribs, pulled pork, brisket and chicken wings, by the time it is your turn to order, you should already know what you want. By the way, have I mentioned I’m kinda impatient. My order to process took no longer than a minute. I got their sweet, mild and applelicious sauces. The ribs were definitely cooked very well. The meat easily pulled off the bone, but not falling off the bone. It had a little bit of a charred crust and retained a lot of greasy moisture in the meat. I was very happy with my choice after waiting so long in line. The sauces were pretty good, but I was not blown away by the ones I had. The applelicious was different from most sweet sauces I’ve had before. However, I prefer a sauce that has a little more of a peppery bite to it. Overall they were really good ribs and I see why they were 2nd place. So here’s the thing I really don’t like about ribfest; there is only one sorta local vendor, Bad Azz BBQ. There are so many great BBQ restaurants here in Pittsburgh that I wish would get the attention Heinz Field gives to these vendors from all over the country. Would I go to Ribfest again next year? Sure, but I would probably go earlier for food, or plan on spending over 2 hours there just to make up for waiting in line. The ribs I had this weekend were good, but usually I would prefer to have to pay a small fortune to a local BBQ restaurant. Over the years I have definitely found some I really like and some that I never have to visit again because better ones have opened in Pittsburgh. I hope in future posts to start visiting more of the BBQ in Pittsburgh.